Recently, I bought a Dell Latitude 7350 2-in-1 laptop to replace my dying relic. 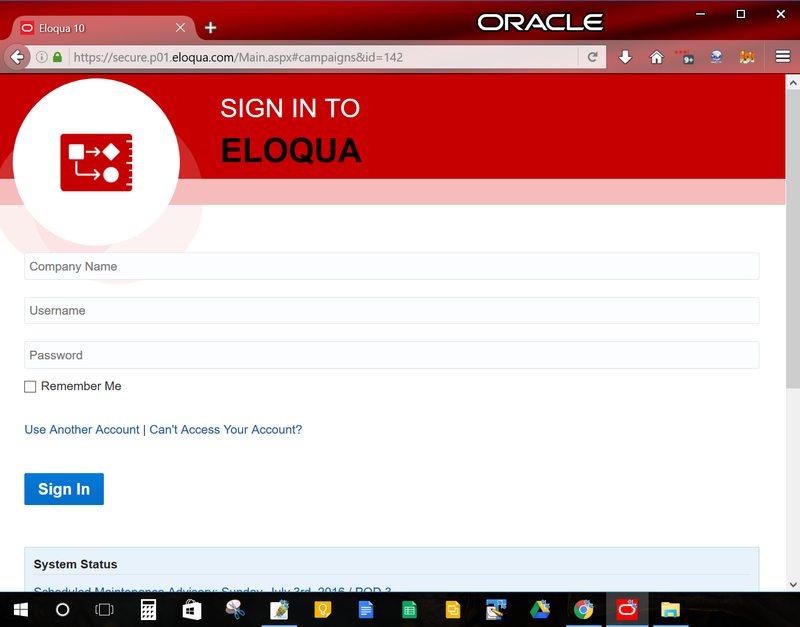 Upon loading the latest of all software, I noticed that Eloqua no longer worked in Chrome. 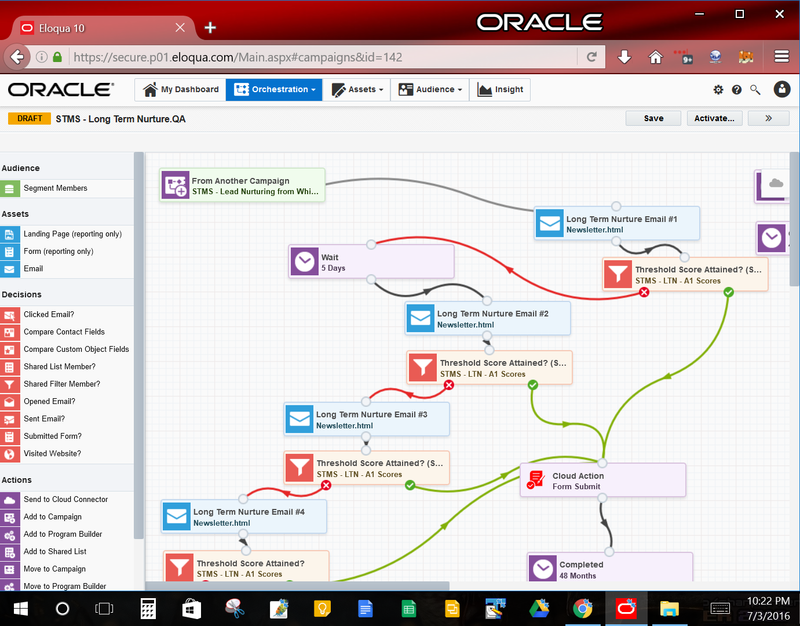 I could use my mouse to hover all of the mouseover DIV overlays for navigation; however, I couldn't click on anything within the Eloqua screen. I was on the verge of pulling my hair out. I thought it was a conflict with the new touchscreen because I had the latest version on my previous laptop--so I believed. It turns out I didn't as an Oracle representative got back to me and said that only Chrome v48 is supported and I was running Chrome v50 on the new computer. 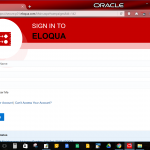 Oracle suggested I downgrade; however, I didn't want to do this and I do like that Eloqua runs smoother in Firefox, as I was getting error messages in the Integration areas that forced me to use Firefox to get around that even before on my old PC. I had gotten accustom to using Firefox again exclusively for Eloqua, but I still used Chrome for all other web browsing. Switching between browsers wasn't very fluid, so I added in a few pieces of software to improve upon my user experience by making all of this automatic. How very automation of me. *The solution below can be used for other browser combinations. I chose Firefox because of stability. 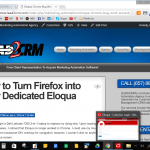 I have been using Browsium Catalyst to handle my browser management, which allows me to have Firefox enabled as my "dedicated" Eloqua app. (Google Legacy Browser Support accomplishes the same thing; however, I found the latter to be more difficult to setup). 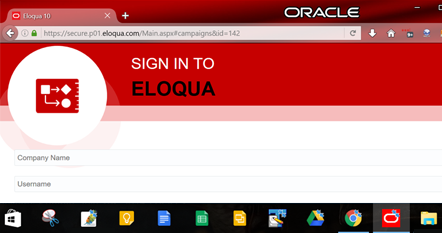 I have configured it to always open a *.eloqua.com URL in Firefox. As it switches to Firefox, it will close the Chrome tab that triggered the browser open. From there, I have Browsium Catalyst configured to also take any web browsing in Firefox that is not *.eloqua.com and send the new URL back to Chrome to keep it as my default browser for web navigation. 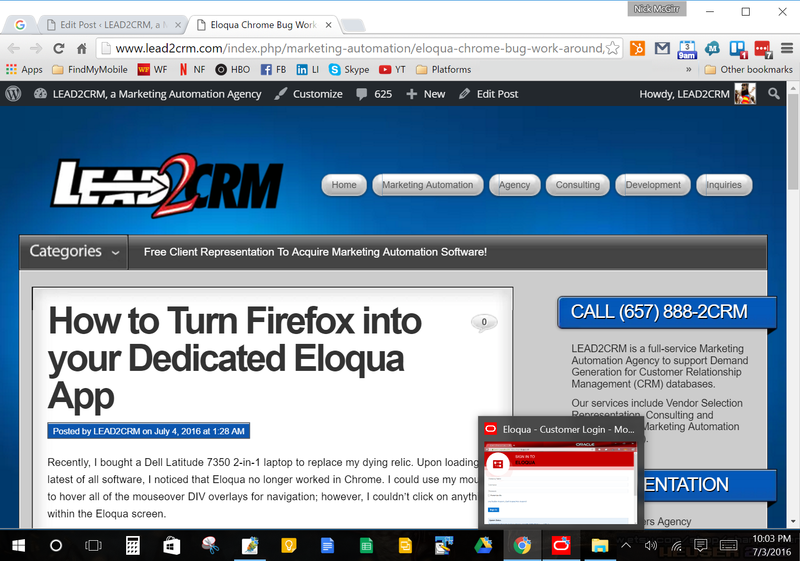 To keep the interface very lean, I removed all bookmarks and tool bars from Firefox and changed the Homepage to automatically load the Eloqua login screen in case I opened Firefox from the desktop shortcut. I also downloaded the Firefox Add-On, "Multifox" to enable the ability to have multiple Eloqua customer instances open at the same time. 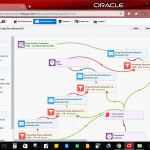 This is great for us Eloqua consultants, but also useful for Eloqua customers that have a Production and a Sandbox instance. Multifox will allow your employees to use both databases at the same time. For the cherry on top, I customized my own Firefox Theme to look Oracle-red and I used "Resource Hacker" to change the Firefox icon to the Oracle "O" logo because I found myself instinctively switching between Chrome and Firefox because I had used Firefox for so many years before Chrome. Changing the shortcut icon actually went beyond a novelty change because it stopped me from getting confused and reinforced that Firefox was my new default Eloqua app. I love the new look and feel of simulating an Eloqua dedicated app from a taskbar shortcut icon and in case you are wondering, I love my new Dell.